"Spooky action at a distance," allegedly was Albert Einstein's annoyed description of Quantum Entanglement, a physical phenomenon that occurs when pairs of particles whose every action affects the other's, remain connected, even when they are separated physically by great distances. Imagine that you are one half of such a connected pair, and you are standing on top of the Space Needle in Seattle. Then imagine that the other half of your pair is a person standing on top of the Empire State Building in New York. As you lift your right arm, imagine that the other person concurrently lifts her left arm in the same way. You then lean forward and she, without any visible means of knowing your actions, leans backward to mirror your movement. Then you lean backward, not knowing that at the same time your New York partner-pair leans forward. That sequence of reflected actions is what Einstein called "spooky action at a distance." Although the two of you do not see each other and are not communicating, your connectedness is operative in how you both mirror each other's actions simultaneously despite the distance. According to quantum entanglement observations, it appears that space is not empty, and that distance doesn't separate or disconnect particles of connected pairs. There are several provocative hypotheses and conjectures about the phenomenon, including the curvature nature of space, bridged by a latticework of wormholes. Importantly, however, there are no arguments about the existence of the phenomenon itself. The world and the universe at large appear to be a connected system, where what occurs in Seattle evokes a real-time response in New York, or anywhere else on the planet. In fact, let's expand this concept. In galactic terms, we can imagine that what occurs here on Earth is known and responded to on Andromeda, the nearest major galaxy to the Milky Way, a little more than 2.5 million light years away. Then imagine that what occurs here and is known on Andromeda simultaneously is known on Alpha Centauri, the closest star system to the solar system at 4.37 light-years from the sun. I don't know about you, but this thought experiment imagery is mind bending for me. The seemingly empty space around us appears to be entangled and connected at the particle level instantly. It takes 8 minutes and 17 seconds for light to travel from the surface of the sun to the Earth at the speed light travels, approximately 186,282 miles per second (300,000 kilometers per second.) That's very fast. But quantum entanglement describes instantaneous action which is infinitely faster. In fact, it describes events that occur simultaneously, without needing to travel through the time-space factor at all. And that brings us to leadership. I propose that you consider your team and your organization to be an entangled system, one in which leaders' actions provoke mirrored reactions not at the speed of light, but instantaneously. In practical terms, the CEO of the company thinks what she wants to say, and the organizational response occurs before she articulates her thought. It's as though the thought and the response are inseparably connected occurrences. Surely you have had a similar experience in your own relationships. Corporate news does not travel at the speed of light; instead, events seem to co-emerge in an entangled way. The question arises then, if leadership instantaneously is connected to the organizational system, what are the implications for leaders? 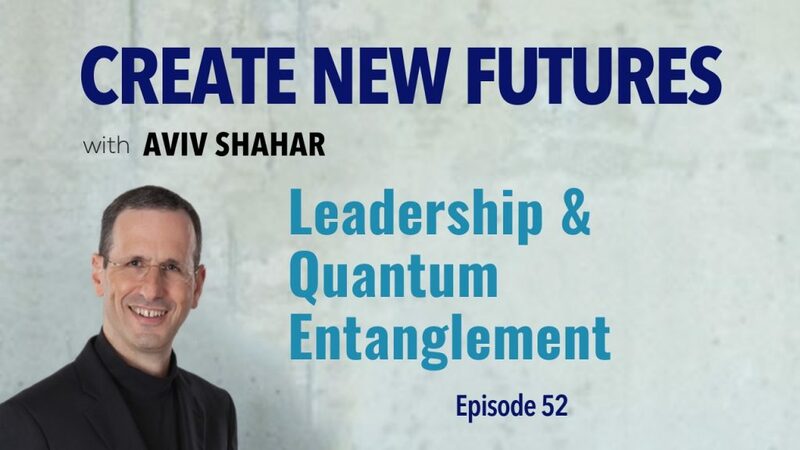 What is the behavioral imperative of the quantum entanglement scenario in organizations? We can suggest the following observable connections: an anxious leader creates anxious organizations. A dishonest leader produces deceitful teams. Generous leadership promotes kind and generous organizational conduct. Animosity and fear beget distressed hostility. Compassionate service evolves into a service orientation that's attentive and compassionate. The quantum entanglement imperative for leaders therefore is threefold: first, to foster a self-aware organization, practice self-awareness. Second, be intentional, acting with a purpose in mind. And third, forever continue to learn, grow and develop. You cannot promote a learning organization without being deeply engaged in learning yourself. As a leader, your impact on the organization is infinitely larger than you imagine. And yes, potentially, the impact of every other person on the organization is also infinitely larger than they imagine or believe. The leadership quantum entanglement insight suggests that every individual in the system carries an extraordinarily awesome potential to impact the system at large, because each person can trigger a positive or a negative entangled movement. Just one out of 1000 people believe and feel empowered to own and step up to such a tremendously and extraordinarily powerful impact. You can step up and begin today, right now, to realize your great power to impact your environment. Recognize you are an integrated part of an entangled field of organizational consciousness and intent. By showing up purposefully intentional, you create a spooky set of concurrent events throughout your organization, even when you do not see them or get immediate or visible feedback. The response and the feedback will find you soon enough, because they already have been triggered. Now it's your turn. Turn the key. Become conscious of the entangled world around you. Live into the connected organization you lead by being intentional and open to the co-creative learning feedback loop.